This is the English short version of the report ‘Vägval 2030. Färdplan för snabbomställning till HÅLLBARA persontransporter’. The report is written by researchers from Blekinge Institute of Technology (BTH) based on a close cooperation with partners from the first phase of the GreenCharge project (2011-2015). See the report backside for a list of the project partners in Spring 2015. The English report with a foreword by Peter Newman is available here. You will find more information in Swedish at our website, including a video, a book summary and a full-size book. The transport sector’s dependence on fossil fuels is one of the biggest challenges in a shift towards a climate-neutral and sustainable society. The results of the report are summarised in figure 1 below. Figure 1. 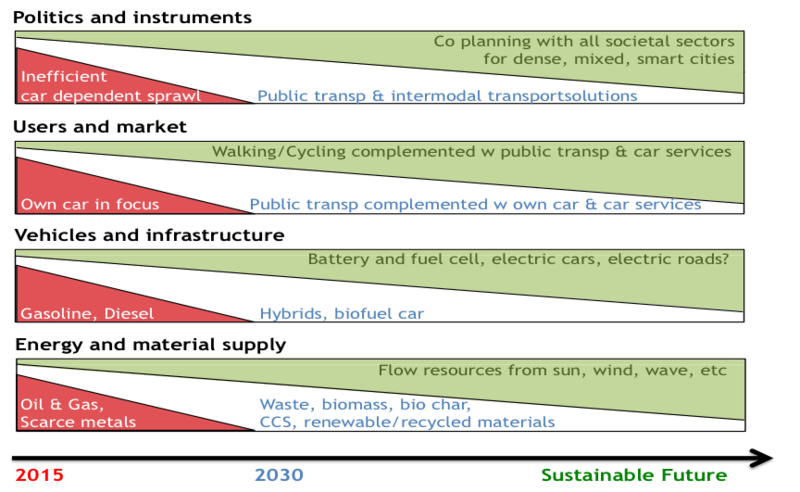 The road to a fossil-free and sustainable personal transport system. How the four identified subsystems can be developed to phase out fossil fuels by 2030 and pave the way for a sustainable future. The report shows that today’s focus on fossil independence and measures against climate change must be broadened to cover the whole sustainability challengeso that other sustainability issues are addressed and so that solutions to some of the sustainability issues do not create new ones. Even geopolitical benefits are likely. A global transition to transport and energy systems based on energy from widely available flow resources like sun and wind instead of the limited fossil fuels would likely reduce the conflicts risks in the world.Restricted cobalt, lithium and platinum resources that battery and fuel cell cars depend on, and other metals needed for solar cells and wind turbines can, however, give rise to similar conflict risks. This roadmap report’s recommendations on reduced transport needs and car dependency and its focus on resource efficiency counteract these conflict risks by striking against underlying resource-driving mechanisms. Should this roadmap be translated into practical policies, the forthcoming transition would therefore likely be made considerably more ‘future-proof’.